( please see accessories at www.nationalguitars.com ). The Hot-plate is available only in the sieve-hole coverplate pattern and can be ordered in either bright or rubbed nickel finish. The rubbed finish looks best on the new El Trovador whereas the Estrellita Deluxe and the 12 fret Style 0 use the brighter, more shiny nickel finish. One nice feature (and there are many) of the Hot-Plate is that its slightly oblong screw holes around the perimeter allow for it to fit vintage Nationals without disturbing the authenticity of an older instrument. 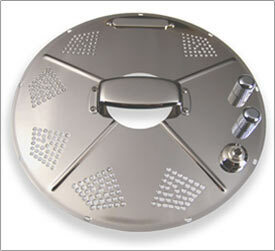 The Hot-Plate is interchangeable on any single cone National resonator guitar. Just take off the original coverplate with a tiny screwdriverr and install the Hot-Plate. Keep the original coverplate in a safe place and should you ever decide to sell or trade your National you can replace it, keeping the Hot-Plate for reuse on your new single cone resonator. Installation should take no more than 10 minutes. Just take your strings off, change out the coverplates, plug your guitar cord into the input jack on the Hot-Plate and you'll be good to go. No walking to the amp to adjust your volume or tone, the controls are at your fingertips. The pickup is a high quality, Tele-style Lollar "Special". "Very elegant design and execution! It sounds fantastic. I love the rich round tone of the Hot-Plate. The lows are meaty without being distorted and the highs are clear as a bell. I love the sound of the El Trovador unamplified but the Hot-Plate really does a great job of simply making that natural sound louder with no sacrifice of tone. The tone and volume controls work great and installation was quick and simple. I'm completely happy with it, thanks Mike." To order the Hot-Plate (or any other National Reso product) just send me an email. Price of the Hot-Plate with my discount is $360 plus $15 shipping in the US. Customers outside the U.S. please contact me for payment and shipping information. Hurry, they're selling like Hot-Plates.